Shiraz by Taltarni of Pyrenees. An alluring assortment of uplifted black cherry and dark berry flavours, espresso and licorice allsorts. The quality of Shiraz grown to parched vineyards in Victoria's rugged western districts, has been well known throughout the world of wine since the days of gold rush and early settlement. The vigorous, fruit driven palate resolves on a juicy cherry acid finish. The rebirth of Taltarni Vineyards in 1972 was something of a renaissance for the Pyrenees, a winegrowing region that had slipped into a nadir after a vticultural history which dates back to the mid nineteenth century. 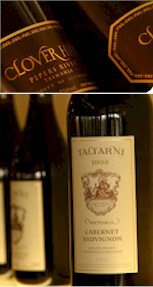 Today, the Taltarni Estate's fundamental philosophy is to produce distinctive, well-balanced premium varietal wines with recognizable regionality and estate styling. Founding father, Yorkshireman Edwin Makereth, a farmer and miner, first planted vines around Avoca in 1887. His adviser was an Italian viticultural expert, Romeo Bragato, who claimed that Avoca was better suited to winegrowing than most other districts in the colony. He particularly noted the area's good drainage, and advised the planting of shiraz, pinot noir, mataro and verdelho. Romeo Bragato endeavoured to encourage other farmers to establish vineyards in the area. The depression of the thirties, World War II and the wool boom of the forties eventually saw the demise of the fledgling local wine industry, and Avoca almost lost its viticultural heritage. In the early 1960s, ex-schoolteacher turned earth moving contractor, Walter Henning combined forces with some Ballarat businessmen and began the search for land to plant a vineyard. They hired a plane and flew all around the Pyrenees, looking for a suitable site. Finally they settled on the Moonambel area. The current 1700 acre site, which Walter Henning was to baptize Taltarni, became one of the founding wineries of the new age of the Pyrenees. The original sixty acres of vines were developed by David Hohnen, who later went on to found Cape Mentelle in Margaret River. After seeing Taltarni through it's natal period, Walter Henning passed the estate onto John Goelet (and Red Earth Nominees Pty Ltd) shortly thereafter in 1972. John Goelet selected Taltarni Vineyards after a worldwide search of the finest wine growing regions. The chosen site, with its red clay, quartz and sandy loam soils and cool Continental climate, was destined to produce premium quality, internationally acclaimed wines. In 1976, viticulturalist David Hohnen handed the reins to Dominique Portet, whose brother, Bernard helped find the vineyard on behalf of John Goelet. Bernard Portet had previously operated John Goelet's Napa Valley vineyard, Clos du Val. The dedication and energy of this formidable team carved Taltarni's early growth and international success. From the outset there was a strong French influence, no more evident than in the vineyards which were planted to the classic Franco grapes. Taltarni has consolidated on a strong international reputation for its portfolio of premium wines, especially the long-living red wines, sensational Methode Champenoise styles and varietal sauvignon blanc (originally labelled as Fume Blanc). There are now 326 acres of cabernet sauvignon, cabernet franc, merlot, pinot noir, shiraz and sauvignon blanc under vine at the Taltarni Estate, with additional plantings of chardonnay, malbec and most recently, sangiovese. The current portfolio features two superb sparklings, Taltarni Brut and Brut Tache, a range of mature vine premium estate grown reds, as well as the refreshingly crisp Sauvignon Blanc and zesty Rose. Taltarni also produces wines under it's Fiddleback, Lalla Gully and Clover Hill portfolios. Twenty years after Taltarni's conception, Red Earth Nominees crossed Bass Strait where, after a further two year search, purchased and established the Clover Hill Vineyard in northeast Tasmania. Near Lebrina, this 163 acre (66 hectare) property, which enjoys a remarkable vista over Bass Strait, has been especially tailored for premium sparkling wine production. Chardonnay, pinot noir and pinot meunier grapes all thrive in it's rich, well-drained soils and cool climate. More recently, in 1998, Taltarni's third vineyard was acquired and developed, Lalla Gully, just a few minutes drive from Clover Hill. Lalla Gully is a picture perfect speciality vineyard growing cool climate chardonnay, sauvignon blanc and pinot meunier.